Quick Deals Group Order Awards & Testimonials Sign Up For Deals! Selection of one soup: Egg Drop Soup, Hot & Sour Soup, or Wonton Soup. Appetizers: Bo Bo Platter. Choice of any entree (excluding chef's specialties). (11:00 AM - 3:00 PM) All lunch combinations are served with crab rangoon and spring roll. Choice of egg drop soup or hot and sour soup, steamed rice or fried rice. The Squire voted Golden Palace as the "Best Chinese Restaurant" from 1991 to 1992. 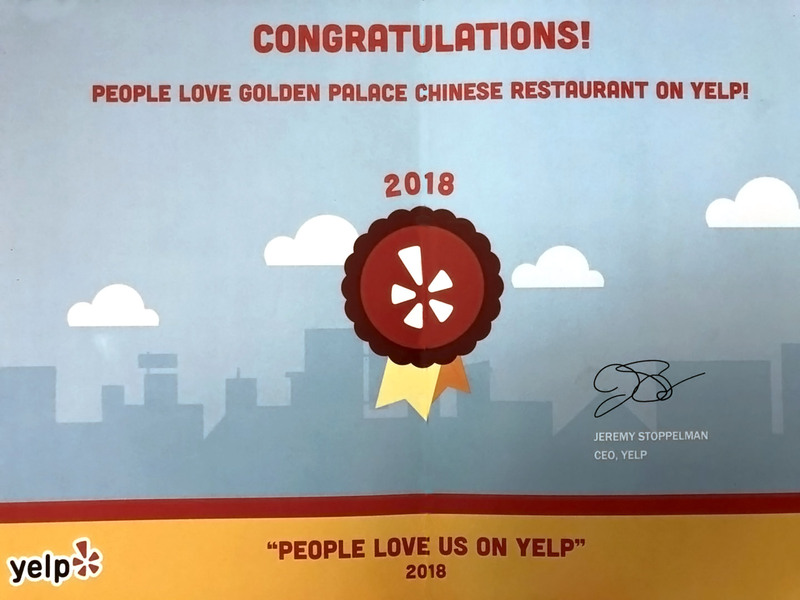 In 2003, Golden Palace was the "reader's Choice" winner. In 2008, Golden Palace was nominated for the Top 100 Chinese restaurant in the United States. Golden Palace was the first Chinese Restaurant in Olathe, KS. For the last twenty years, we have been serving delicious and healthy food to our customers by using fresh and quality ingredients. We take pride in continuing to strive for each customer's utmost satisfaction. We are located at Northwest Corner of 151st street and Mur-Len Road. Please feel free to order by phone or online today.